Can you diagnose diastolic dysfunction by ECG ? We presume ECG fails miserably against echocardiography for assessing hemodynamics , while echocardiogram has little value when it comes to studying electrophysiology . Ironically , we often ignore the fact , ECG can provide important long-term hemodynamic data . The pattern of chamber enlargement give us vital clues to the prevailing hemodynamic stress and loading conditions. While echo can be termed as an anatomical and physiologic modality , ECG apart from its unique capacity to record cardiac electrical finger prints , it provides useful , anatomical , hemodynamic information too ! If LAE is so important to diagnose diastolic dysfunction , why we are so obsessed with doppler filling profiles of mitral valve ,pulmonary veins, mitral annular tissue Doppler and what not ! .Many of these sophisticated doppler methods are extremely operator dependent and are subjected to technical and mathematical errors. Especially , with tissue doppler where we magnify the errors as we filter extremely slow tissue motion . 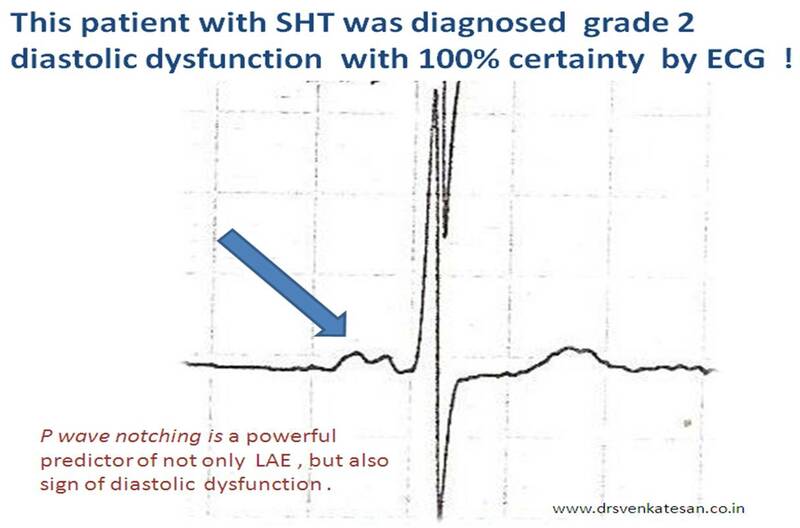 For many decades we have failed to impress ourselves , about the importance of subtle P wave abnormalities in the ECGs of hypertensive patients. In fact those innocuous looking slurs and notches in P waves , suggest the left atrial stress and a definite marker of underlying LV diastolic dysfunction . P wave is the only electrical wave that occur in diastole .Hence there is no surprise ,i gives us enormous information about this phase of cardiac cycle . If only we look at them carefully, zoom it (Now it is made easy with so many softwares) analyse critically we can find a wealth of information about the atrial behavior in hypertension. Experience from our hypertension clinic with periodic echocardiograms suggest , the following ECG findings can be good markers of significant diastolic dysfunction . * Surprisingly , these abnormalities correlated with at least grade 1 diastolic dysfunction even in the absence of for LAE or LVH by echocardiogram. 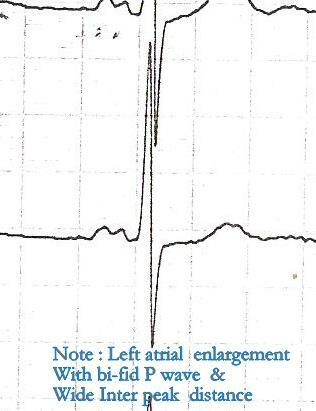 ** In an occasional patient P waves can widen due to inter atrial block or conduction delay. This a rare exception for wide P waves without LAE. A well recorded and analysed ECG can predict diastolic dysfunction with fair degree of accuracy .This fact need to be emphasized by every one . Next to ECG , LA size and volume by 2d echo are excellent parameters to assess diastolic function in a long term fashion. Sophisticated but error prone , momentary doppler parameters are getting too much attention at the cost of simple , shrewd ECG and 2D echo ! 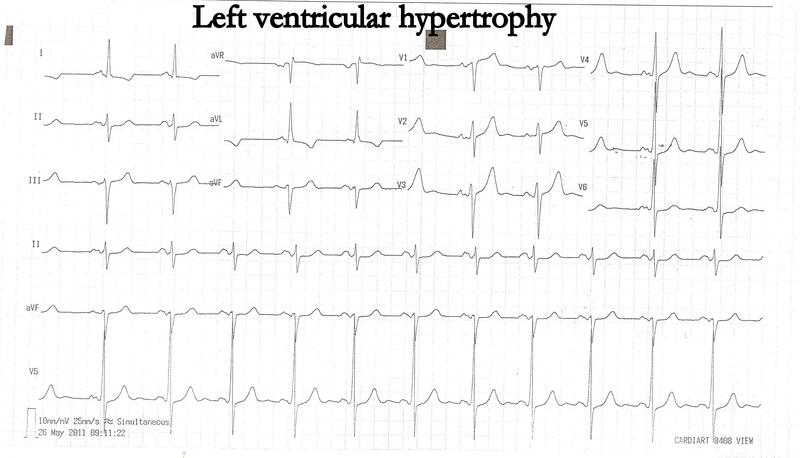 How to miss left ventricular hypertrophy in ECG ? 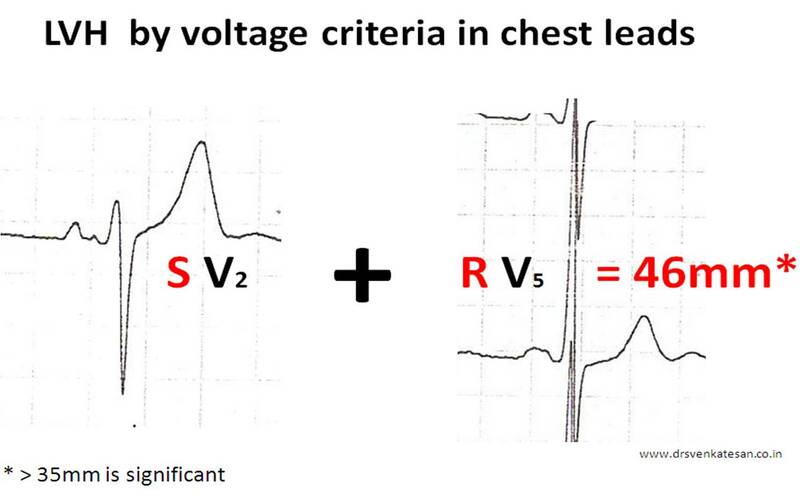 LVH can be diagnosed with fair degree of accuracy by surface ECG . We have a set criteria .The Estes scoring is the most popular. Very rarely we have all the classical features of LVH in a given ECG . With the advent of echocardiography ECG diagnosis of LVH has become redundant . Still , it is essential to build the foundations in cardiology for the current generation cardiologists. It is our belief qRS voltage would faithfully reflect the quantum of cardiac muscle mass , but in general to equate qRS voltage to myocardial mass is a huge error we make ! (Of course It may be true in some cases following MI ) . The qRS voltage is determined by numerous factors (Important ones are : chest wall thickness , age , LV cavity size , amount of blood inside LV cavity, heart rate , conduction delays etc ) This is the reason a 10-year-old boy’s ECG will satisfy the criteria of LVH by 100 % .Do not ever report a ECG without knowing the age of the patient . Chest lead always balances RV and LV forces .One can mask the other .So be ready for surprises when you find a perfectly normal ECH in bi-ventricular hypertrophies ) A balancing act ! The axis deviation is again non specific . The LV mass shifts the mean axis to left (Beyond -15 degrees) .The axis shift would also be contributed by mild forms of LAFB . This fascicle which criss crosses the LVOT easily gets injured to hemodynamic stress ( or rather insulted ) and lose its function . So its job is transferred to the posterior fascicle which shoots towards anterior and superior and left , hence the left axis deviation) .The LAFB is generally a benign defect unless it occurs in an acute fashion as a response to ischemia. This need not be present in every one with LVH . It happens only if LVH is associated with relaxation defect , when it calls for LA’s assistance . (In other words , presence of LAE in hypertensive patients is a sure and simple way to confirm diastolic dysfunction ) . Similarly absence of LAE ( with a significant LVH ) is a good sign as the LV is able to tackle the hypertensive stress in solo fashion in all likely hood free from significant diastolic dysfunction. Apart from LAE , note also the p wave encroaches good part of PR interval . 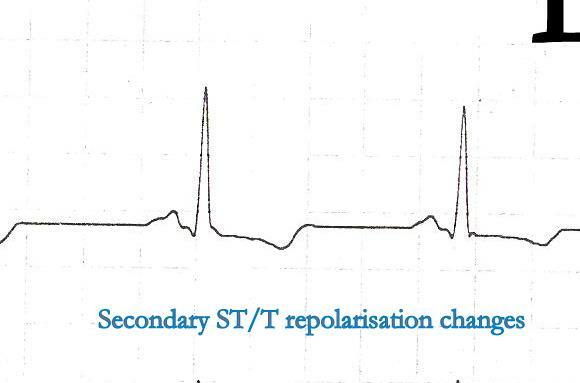 Because of this the repolarization is recorded opposite to that of depolarization .Hence we get all sorts of secondary ST /T changes. (The term secondary is used to denote secondary to alteration in depolarisation ). Many times all of the following could mean the same in the bed side clinical parlance ! LV systolic over load etc . Note : Primary ST depression occurs in true ischemia without any alteration in LV Mass or conduction defect. *** For advanced readers only : Some of the ST depression that occur in ischemia could again be secondary changes. This needs further reading. Echo is the gold standard for diagnosing LVH .There are two definitions . LV mass > 200mg in men and 175mg in women is considered LVH . LVH based on LV mass is ideal . But can be misleading in a dilated heart where the mass may be increased with a relatively thinned out IVS . There are numerous ways to miss LVH in ECG, But the definite way for not missing is by echocardiogram ! Confrontations with ventricular septal rupture ! Mechanical complications are not rare following acute MI .In fact , it closely competes with electrical deaths . Many times it is not recognised and get wrongly labeled as simple pump failure . The early days of STEMI is critical . This is the time the infarcted muscle softens and invaded by blood components like neutrophils etc. The biochemical events in the infarct zone is a least studied aspect by current generation cardiologists. Some , especially women tend to lyse their interstitial collagen faster. This minute break ups coalesce to form a tear , When this tear is subjected to hemodynamic stress and mechanical stretch a rupture is all too likely. The rupture site is predetermined by the patients fate !. If the tear occur in free wall of LV , in all likely-hood ,we are going to lose the patient. If he is blessed , the rupture take place in the interventricular septum .Here , the issue is less disastrous as the blood is simply shunted to a different chamber .In fact , some consider VSR puts an ailing ventricle at a slight hemodynamic advantage which is referred to as decompression . The LVEDP has a biphasic response to VSR .An initial raise bfollowed by a flat response.This has a clinical correlation too with a temporary deterioration and subsequent stabilisation. The issue of thrombolysis and ventricular rupture was controversial for decades .It never got a correct answer and finally we have our own conclusions . Thrombolysis as such reduces the net incidence of ventricular rupture even though late thrombolysis do increase the risk of rupture. What does the above statement mean to you ? confusing is isn’t ? For population based approach thrombolysis has a no negative impact , but in a given individual one has to weigh the risk vs benefit . Sort out a elective plan. * Exceptional case not to be taken as a model for management. There is rarely an agreement between surgeon and cardiologist in timing intervention in VSR patients. Treatment protocols vastly differ in various institutions with the common theme being early surgery . Cath based therapy for VSR closure is still considered a cardiology adventure sport . The doppler VSR jet if reaches 4-5 m/sec (65-100 mmhg) the prognosis is often good , as it indirectly reflects the native LV function .A ventricle which could generate 100mmhg pressure head, even after a supposedly large MI is great by any standards.These are the ventricles that fight till the end and patients do well in the adverse circumstances. In the other end of the spectrum we have a VSR with a faint murmur and 3m/sec jet .They will be hypotensive and end up in shock soon. Infero posterior VSRs do badly due the complexities of tears. Medical management do have an important role in stabilising these patients. Does the pulmonary artery pressure increase with exercise? Pulmonary artery pressure (PAP) is not supposed to increase beyond few mmhg. The diastolic pulmonary artery pressure can not afford to increase even those few mm. If it does , it can cause serious hemodynamic and oxygenation issues. Both these statements are based on strong scientific beliefs But now we realise the margin of these elevation has been revised a little higher in normal persons . In health , athletes can reach a systolic PAP up to 40mmhg . Diastolic PAP still largely remain a mystery . You can’t measure it when the patient is running you know ! Here is a recent article from chest (2011) which documents pulmonary artery systolic pressure in trained athletes . Relationship between exertional dyspnea and PA pressure. * Note : Exercise induced pulmonary artery pressure elevation are well-recognized in pathological states. Does the LV “Ejection fraction ” change with every heart beat ? 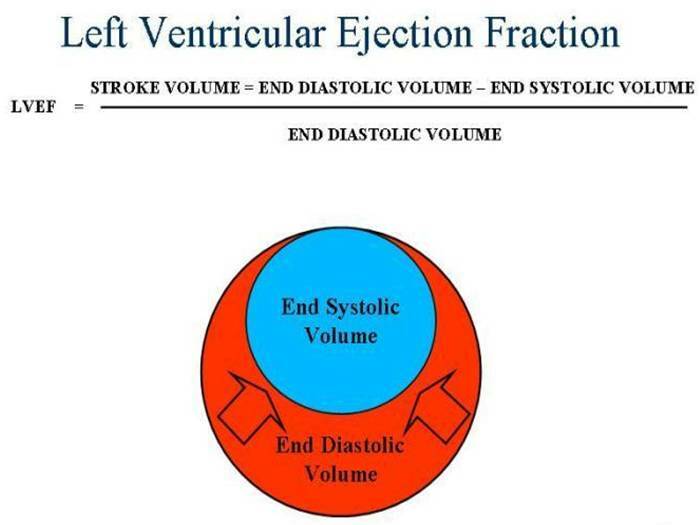 Can the LV ejection fraction change with every heart beat ? EF % is one of the glamorous cardiac functional indices that has caught the imagination of both patients and physicians. How accurate it is ? How reproducible it is ? How many methods are available to arrive at EF % ? All these make this index a highly variable parameter( next only to your city temperature ! ) This happens whether you measure EF with M Mode, 2D Simpson , 3D volumetric etc . * The term “beat to beat” changes may be a little exaggerated statement .It is used to convey the point of ” huge variability” of this parameter. It means there can be variations of EF % with varying heat rate. The heart is not an Independent organ rather, it is a slave to preload and afterload ! How to overcome the limitation of EF ? To overcome this error a new parameter called myocardial performance index (MPI) which accounts for heart rate came into vogue . (Did it come really ? Ihaven’t seen a single cardiologist do this in his clinic ) . 3D volumetrics, velocity vector imaging , and many other innovations has been added. Nothing was able to replace the EF % . Because of complexities in the newer modalities most cardiologists (including the author ) continue to romance the much flawed EF % . Simplicity shall reign supreme . . . in spite of inaccuracies , in any walk of life ! How does EF change beat to beat ? The answer is simple . The contractility of heart is dependent upon the previous diastole , during which heart fills. Heart is primarily an elastic organ. Whenever the filling is is more ventricle is stretched more ( diastolic filling is the stretch ) and the subsequent force of contraction is more . This is the basis of famous frank starling law. LV filling is dependent on RV filling which in turn depend on venous return ..Venous return is a function of vascular tone and the persons physical activity . ** Every one of us is aware about the huge influence the preload has , on LV contractility . Surprisingly, it can also swing with changing after load . This fact is often under recognised .This is called Anrep effect . So , imagine the scenerio . . .the heart is simply a “squeezing- slave” of pre load and after load ! . . . And still we are happy with assessing the cardiac function , in isolation without giving any respect to the loading conditions. EF , would rank first among all medical investigations , that is significantly flawed , still continue to enjoy huge popularity ! It has little value as a screening test for assessing LV function in general population . But , it has an important role to assess the damage following MI and in the follow up of patients with significantly compromised LV function. Cardiologist are aware of this fact , but most non cardiologists , especially Anesthetists and Surgeons revere the EF% with sanctity . This is definitely un-called for . It is the duty of the cardiologists to pass on this message to their colleagues in other fields. Trans catheter aortic valve implantation(TAVI ) is gaining acceptance as an alternative to surgical aortic valve replacement .It has successfully negotiated the initial hurdles and entered the clinical domain . More and more patients receive this modality as the expertise and hardware show consistent improvement. Although TAVI is limited to patients in high risk category for surgery , it is expected to make in roads into intermediate risk patients as well and pose a real threat to cardiac surgeons in the years to come . The only point surgeons can rejoice is , it cannot be implanted in patients with aortic regurgitation as of now. This video is posted free by NEJM , is stunningly clear in conveying concept of TAVI ! And this one from Siemens seems to beat the NEJM .